Hudaydah(ANN)-The international airport of Yemen’s western city of Hudaydah still firmly resists occupation by a Saudi-led military coalition despite scores of airstrikes pouring on the compound, a lifeline to millions of Yemenis, thanks to the impoverished country’s army, supported by allied fighters from the Popular Committees and those of the Houthi Ansarullah movement. During the past few days, warplanes belonging to the Saudi and Emirati-led coalition have hit the vital airport with dozens of airstrikes, as Saudi-supported militia loyal to Yemen’s former President Abd Rabbuh Mansur Hadi attempt to gain ground toward the compound. Since Saturday, the so-called coalition has announced a number of times that they had managed to fully capture the airport, but each time it was revealed that the airport was still in the hands of Houthi fighters and Yemeni troops, and that the compound was only within the reach of repeated air raids. 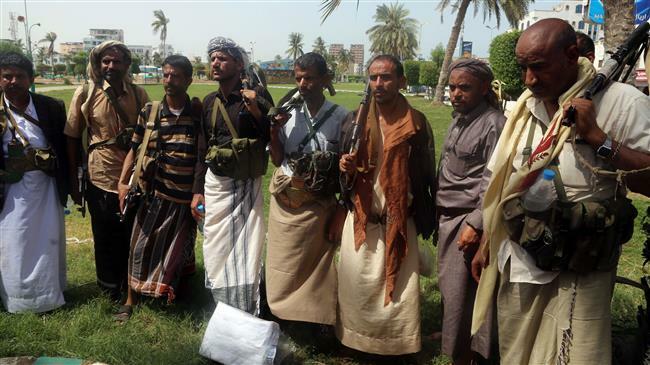 On Tuesday, Ebtesam al-Mutawakel, the head of cultural front against the invaders in Hudaydah, said Yemeni army troopers and Houthis fighters had successfully repelled attacks launched by Hadi’s militia and the collation’s mercenaries. In an interview with Lebanon’s al-Mayadeen television network, she added that most of the fighting had been restricted in the Doreihami front, outside the port city, as for Tuesday. Mutawakel also said Yemeni forces on Sunday had managed to push the fighting ground with the Saudi-led forces some 40 kilometers away from the airport. She further said life and traffic in Hudaydah was almost normal. After nearly a month of sporadic clashes between Houthi forces and the coalition, coupled with Hadi’s militia, in the volatile province of Hudaydah, the latter two launched a major offensive on June 13 to take the Houthi-held Hudaydah, a densely-populated city and the war-torn country’s most vital port, which is the entry point for 70 percent of the impoverished country’s imports. Meanwhile, Mohammed al-Bukhaiti, a top official in Ansarullah’s political bureau, said fighting with Saudi-led forces was focused in southern parts of the airport, and that the collation’s warplanes had provided air cover for ground forces. Bukhaiti added that Yemeni forces had managed to destroy at least eight military vehicles of the coalition in al-Davvar area only. He also said Yemeni fighters not only blocked the invaders’ advance in six fronts around the city but also managed to destroy a large number of their military and armored vehicles. The Yemeni official further said the coalition had so far failed to capture the strategic airport let alone the port city itself despite all their forces and military equipment, adding that the Saudi-led alliance tried hard to launch a successful media war against Yemeni forces and to lower their morale by spreading fake news, including the purported fall of the airport. According to a report by Yemen’s Arabic-language al-Masirah television network, Yemeni forces have so far managed to seize at least 10 military vehicles of the coalition forces, whose warplanes and Apache helicopters hit the Hudaydah airport with at least 40 airstrikes on Tuesday. During the past few days, Saudi-led warplanes pounded various parts of the airport with dozens of airstrikes. Al-Masirah further reported on Tuesday that the Saudi-led air raids against the airport had reduced the once vibrant airport to rubble, destroying all its buildings, runways and hangers. In a separate report, al-Masirah, citing an unnamed military source, said Yemeni forces had torched a coalition’s arsenal in Doreihami, south of Hudaydah, destroying all weapons and ammunition inside the building. It added that six Yemeni civilians, including four women, had also been killed in the province on Tuesday after a Saudi-led warplane hit a passenger bus with an airstrike. The invasion of Hudaydah has already triggered fears of a fresh humanitarian crisis in a country where more than 22 million people are in need of aid, including 8.4 million who are at risk of starvation. Saudi Arabia and its allies launched the war on Yemen in March 2015 to reinstall the former Saudi-backed Hadi regime.